Okay, the truth is, trainer Larry Jones will discuss Thoroughbred pedigrees and breeding only if YOU ask him to. Jones will be the next guest on Talkin' Horses, an interview that is conducted with questions submitted by readers of BloodHorse.com. The problem (as I see it) is that most Talkin' Horses segments attract a viewership made up almost exclusively of racing fans. As opposed to breeders or pedigree students. There'll be 200 questions submitted asking such drivel as "How's Friesan Fire holding up?" and "Do you think Old Fashioned can make 10 furlongs?" And how about "Tell me about Hard Spun ... does he like carrots?" I want to know "Have you seen Hard Spun's first foals? Does he stamp his colts?" and "What stallion advice would you give to Gov. Brereton Jones when he's ready to retire Proud Spell?" Read the Talkin' Horses release if you want to know more about the feature. Submit your questions for Larry Jones. I can't force you to make the questions pedigree-related, but I'm asking nicely. We're working on the honor system here, folks. If you haven't already done so, read my comments from earlier this month in Jonesing for the Roses. 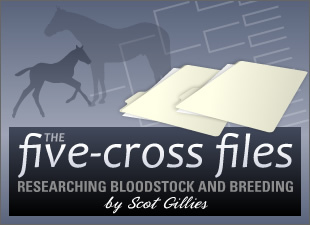 And then come back to BloodHorse.com a week from today -- March 26 at noon -- to hear the audio interview.